A beautiful view of the Daniel Boone National Forest as seen from the top of Lockegee Rock in Morehead, Kentucky. Captured: June 25, 2016 @ 6:34 a.m.
Visit Lockegee Rock and enjoy valuable travel photography tips and advice while exploring the richness of this amazingly well-kept secret. Captured from above the Daniel Boone National Forest in northeastern Kentucky near the city of Morehead, this featured image originates in one of the most beautiful and well-kept secrets on earth. Admittedly, I lived in a nearby town for several years and never heard of Lockegee Rock. Several years later, after moving away, I finally learn of its existence. Deprived of this brilliant photographer’s playground for many of my early years, I now feel compelled to visit as often as possible. Although this location is unquestionably breathtaking, efforts to capture images from the summit will indeed involve a bit hiking and climbing, but it’s definitely worth the journey. Whether it’s travel photography or purely for the love of a great hike, I can’t see anyone regretting making this trip. Regardless of the agenda, a stunning and tranquil retreat awaits the enthusiastic adventurer. This exciting expedition comes complete with exercise, scenic landscapes, amazing wildlife, and primitive camping on location. Additionally, one can expect to find many interesting subjects to photograph along the way, ranging from beautiful rock formations to the artistic graffiti left by residents and visitors. This entire area is an incredible vista surrounded by endless waves of green woodlands in the Daniel Boone National Forest. Furthermore, on a clear day from the summit, the scenic view of Cave Run Lake in the distant background is astonishing. Take a moment and tour my many other images captured from the top of Lockegee Rock. Visit my gallery on Fine Art America. Lockegee Rock is a short trip from town. Although in a relatively isolated area, Lockegee Rock is not a long, arduous journey from town. Starting the trip from the nearby city of Morehead is a short 15-minute excursion. Several local hotels and motels are readily available year-round; however, with Morehead State University nearby, hotel reservations are a wise idea. Additionally, one may find great solitude and amenable accommodation in one of the many local campgrounds as well. Also, the local area affords the opportunity for camping, ranging from RV parks to primitive tent sites. More information is available about the local area in some of my other travel photography. See my featured images, visit Bay Light-Cave Run Lake Kentucky. Although I do consider a trip to the summit a low-level to moderate hike; it’s not that difficult! Conditions on the trail are favorable to anyone sporting mediocre shoes; however, I do recommend a decent pair of hiking shoes with ankle support. Although a short walk from the parking area, approximately half a mile, after crossing a small rock bed, it’s pretty much smooth sailing. There are no streams or arduous leaps to take on your trek leading to the base of Lockegee Rock. After arrival, one can anticipate a short, yet slightly vertical ascent to the summit; though, several paths to the summit exist. Climbing gear, definitely a helmet, may prove beneficial; although, nature has provided plenty of rocks and tree roots to make the climb fairly effortless for anyone in average to good health. An image of the trail entrance leading to Lockegee Rock as viewed from the parking area. An image of the base of Lockegee Rock captured at the trail’s edge. A great hike for almost anyone. While the trip to the base is not that difficult, anyone with limited mobility may not want to attempt a trip to the summit. In any case, the prepared photographer leaves nothing to chance. The mountain is incredible, and if you’re on a mission to capture the vista of the year, don’t forget that you will be lugging your camera gear as well. Plan the trip and take what you need. I always recommend using a checklist for any scheduled shoot. Take a look at my Free Tips to Paradise. Off the beaten path and always open. Lockegee Rock is always accessible to foot traffic throughout the year. No fees or locked park gates to contend with, it’s open 24/7. At approximately 1200 feet, well above the Daniel Boone National Forest, one can easily access Lockegee Rock regardless of what conditions the weather may bring; although, a heavy snow may put a damper in your stride. Snow in the hills of eastern Kentucky can wreck anyone’s travel plans. Even the ascent to the top of the ridge from Hwy 519 via Pretty Ridge Road may become a monumental undertaking. Bottom line, if you’re up to the challenge, the Rock is open for business no matter what time of year or weather. If you’ve read this far, perhaps you’re considering undertaking a voyage to Lockegee Rock. If so, let me take a moment and attempt to describe the beauty of what you might experience. First and foremost, the time of year is irrelevant when debating which season might be the best suited for some good old travel photography. Barring one’s personal preference towards a particular goal, such as white-capped trees, I think all seasons present a beautiful splendor of their own and will undoubtedly yield breathtaking vistas worthy of any award. Located in eastern Kentucky, a chance for snow in the winter months is possible, but one can certainly count on a stunningly green spring as well as summer! Additionally, an amazingly colorful autumn landscape is almost always guaranteed. 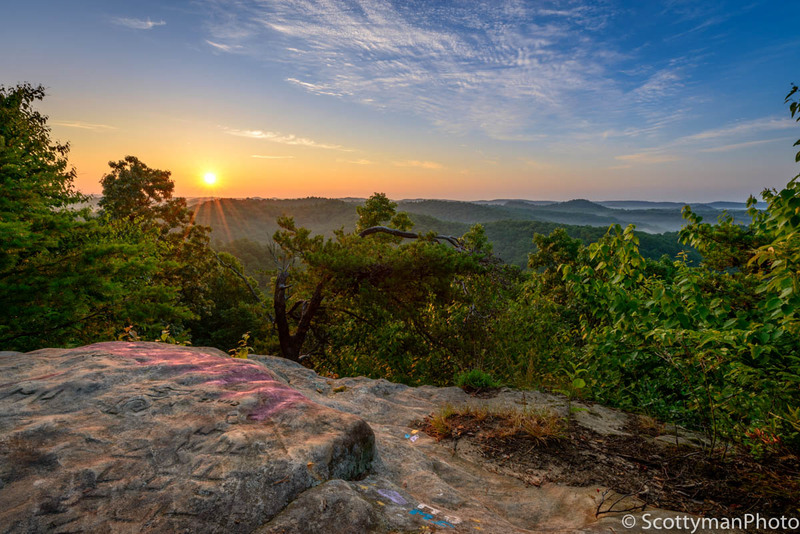 Lockegee Rock offers a 360-degree view of the Daniel Boone National Forest with many interesting foreground subjects along the way to ensure your image pops off the charts. Lockegee Rock offers versatility while providing a photographer the perfect canvas for sculpting a powerful image. The graffiti on Lockegee Rock, mostly contributed by the local population, may add some interesting and unique elements as well as color to an image. Visiting this amazing spectacle on several occasions, I have noticed a continual change in the graffiti from either a new upgrade or addition. As with many cultures, and Lockegee Rock is no different, graffiti and other alterations often reflect the personalities of their inhabitants. Speaking from the standpoint of a travel photographer, having had the good fortune to travel extensively throughout the world, I don’t see the graffiti as a nuisance or hindrance, but rather a unique and exciting human addition to a remarkable creation of nature. Personally, as long as the “art” is not offensive and in good taste, I deem it as value added! Peace and quiet with plenty of fresh air. Limited by writing aptitude as well as many other obstacles; regardless, I doubt my rhetoric gives justice to this beautiful creation of nature. Although I do my best to capture the original beauty of any scene, I feel one must personally experience it! Tranquility is the word that most often comes to mind when I reflect on Lockegee Rock. The air is clean and fresh, while the peace and quiet found on the summit will leave you breathless. Perhaps if I was a resident, I might take this all for granted, although I doubt it! Lockegee Rock is an extraordinary place, and I hope to return very soon. Perhaps you’re from out-of-town looking for a primitive camping experience, or maybe you just fancy staying the night nearby with the prospects of capturing an early morning sunrise. 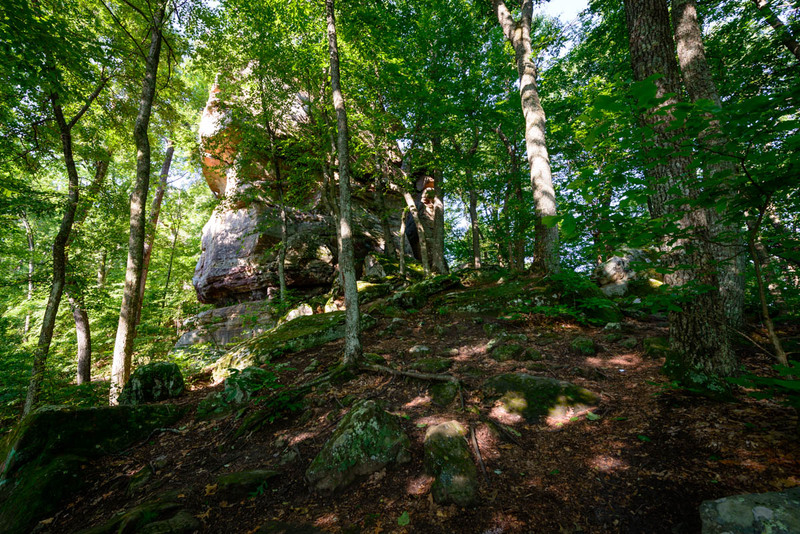 In any case, Lockegee Rock, along with the local city of Morehead, offers a variety of opportunities for camping. 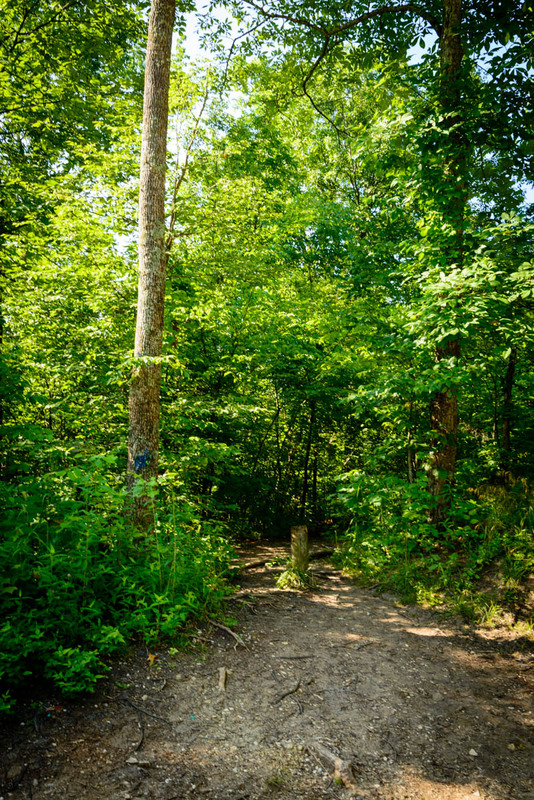 On the trail leading to the summit, several primitive campsites are available to the enthusiastic frontier seeker. Tall and abundant tree coverage in the dense forest provides a cool climate in a well-protected environment to set up camp. Fires are usually allowed year-round, barring a drought. There are no restrictions on campfires unless otherwise posted by the local fire prevention service. If you enjoy travel photography, you’ve found the right place. Regardless of the time of year, Lockegee Rock will deliver beautiful vistas in an array of colors and compositions. From the adventure seeking travel photographer to the professional, whatever your artistic goals are, returning home empty-handed is highly unlikely. Whether you’re sporting an iPhone or a Professional DSLR, Lockegee Rock has an image for everyone to capture. Having photographed this magnificent rock extensively, I feel supremely confident in highly recommending this astounding journey. To see more pictures of Lockegee Rock visit my gallery at Fine Art America. 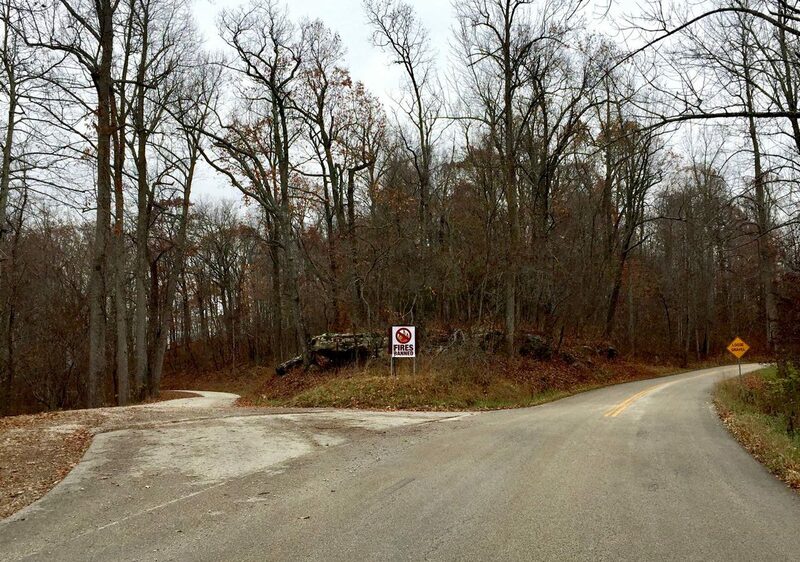 Isolated and rough terrain, the road to Lockegee Rock can present a navigational challenge. 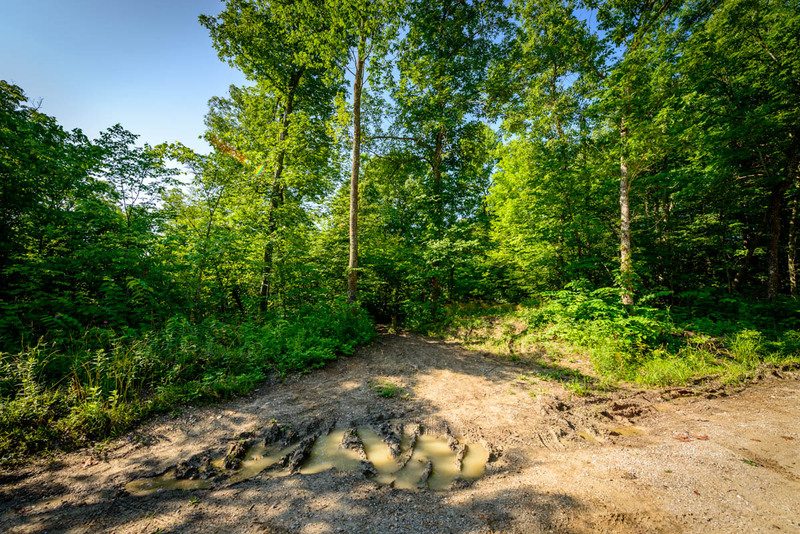 First of all, the transit to the small parking area of Lockegee Rock is not the most difficult to navigate, but does, however, involve a few twists and turns that can potentially lead one on a wild goose chase; although, a wild goose chase is possible near this area. 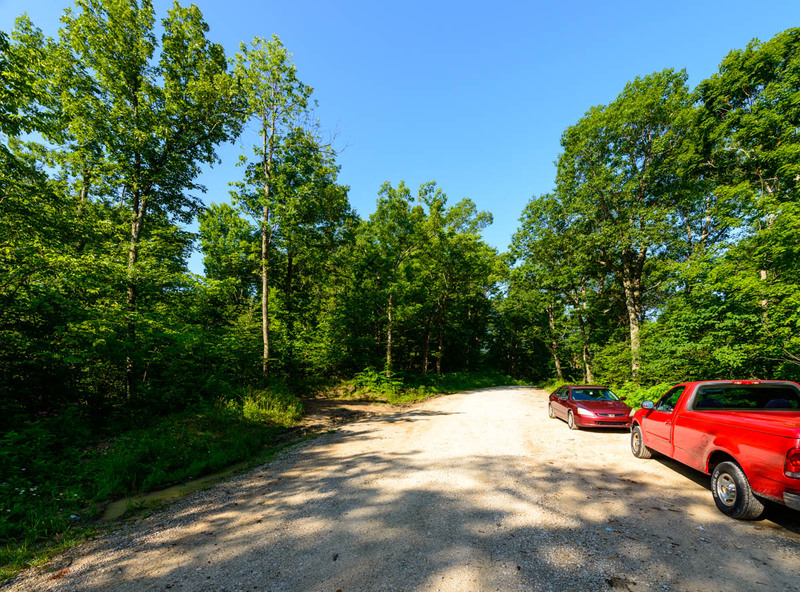 Secondly, after turning on Clack Mountain West Road from Pretty Ridge Road (road 1274) which leads to the parking area, you can expect to travel on a graveled road for approximately one mile. During this arduous run, expect heavy vehicle wear and tear from the enormous unforgiving potholes along the way, especially after periods of heavy rain. I do hope the road conditions have improved. An image of the turn leading to Lockegee Rock at the intersection of PrettyRidge Road and Clack Mountain West Road. An image of Clack Mountain West Road leading to Lockegee Rock. No shortage of Insects, snakes, and animals. 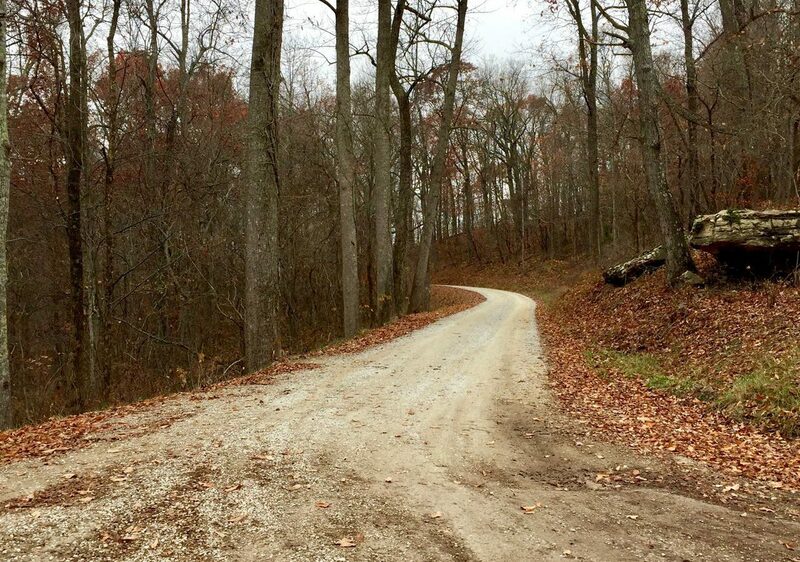 Depending on the season, one may anticipate making some new friends along the trail, and maybe even encounter a giant furry friend along the road from town. While traveling on paved roads, and even more so on the side roads, one can expect a frequently encounter with local wildlife, such as deer and possum. While hiking the trail on the way to the mountain, you may also cross paths with a few of the less friendly inhabitants as well, e.g., snakes. Also, the local flying insects take no prisoners, so don’t forget the bug spray. A close up image of the trail entrance leading to Lockegee Rock as viewed from the parking area. Again, depending on one’s artistic vision, graffiti can add or subtract value to an image. Remember, beauty is in the eye of the beholder. Normally, high humidity in the summer is not without its challenges, a fogged-up lens requires a little patience, but due to the time needed to hike from an air-conditioned car to the summit of Lockegee Rock, your gear should be well acclimated to the humidity by then. The potential for vehicle theft does exist. When visiting Lockegee Rock, I must admit that leaving my car unattended is without a doubt a high-level concern. The road, while infrequently traveled, as well as desolate and dark, presents the potential for theft and is always on my mind. Although having visited several times in the past, I have yet to experience any thievery. Void of a dedicated parking area, Lockegee Rock requires one to pull off to the side of the road and leave their vehicle unattended. There is a small shoulder, but nothing worth mentioning; consequently, when planning an early morning or late evening arrival, I also worry about my vehicle being demolished in an accident in the darkness … and it’s a long walk back to town! Don’t count on calling a cab, although you may have luck with a local tow truck. Fortunately, any sounds originating from Clack Mountain Road will travel very well to the top of the mountain. Typically, I can hear someone coming from quite a distance, though it’s difficult to determine their direction. An image of the parking area for Lockegee Rock located on Clack Mountain West Road. Wear hiking shoes or boots. Although I have witnessed many people climbing to the summit of Lockegee Rock wearing flip-flops, I do not recommend it! Trekking with expensive photography gear, I have no desire to twist an ankle or take a chance on a fall. In any case, I always recommend a good pair of hiking shoes; It’s better to wear them and not need them. Check with the Daniel Boone National Forest Service before your visit. If you’re planning on a campfire, visit the forest service website before your arrival to ensure no fire restrictions are in effect. Observe the weather the night before and plan on an early arrival. I usually favor a plan as opposed to chance; although, occasionally there’s nothing wrong with taking a chance. Nevertheless, I achieve better results with a little forethought and preparation. In addition to having an idea of what the weather will yield, it may also assist with one’s preparations and creative thoughts. In my personal experience, a plan tends to help organize my thoughts, as well as keep me focused on my goals, rather than just snapping away. Click here to read my Philosophy. Take a hiking backpack and maybe a vest with lots of pockets. Having the internet has certainly improved our choices these days. While shopping around on B&H Photo, I noticed a plethora of amazing gadgets and apparel were available for purchase; nevertheless, I don’t have endless amounts of cash to use as a substitute for firewood. With this in mind, I do favor making life a bit easier. My idea of a successful trip to Lockegee Rock includes returning home with a few good images and all my gear intact. I usually just travel with my shoulder bag, see my review of the Think Tank Retrospective 20; however, you may prefer a backpack, especially if you’re camping. Sporting a comfortable as well as a practical backpack is certainly worth investing a bit of cash. Maintain positive control of your gear, as well as yourself, at all times. If you’re interested in travel photography or you spend lots of time outdoors with your camera, you may consider investing in a photographer’s vest or some type of gadget with pockets. Losing a lens cap over the edge is one thing, but I would sure hate to lose something more valuable! I recommend keeping items close and secure, but if you should drop something over the edge, there is a small chance of recovering it, if it survives the fall. Lockegee Rock does have a 360-degree path around it. Additionally, keep in mind that a few people have fallen over the edge throughout the years, see the local Morehead News. Anything is possible, but as long as you take proper precautions and practice some basic safety, you’ll be okay. One can never be too cautious! Of course, this goes without saying, alcohol and Lockegee Rock don’t mix! Do NOT forget the knee pads. On occasion, leaving my knee pads behind is usually not devastating, but when photographing on the top of Lockegee Rock, it’s essential gear. Moreover, I’ve noticed that the older I get, the more I enjoy using them. If you’re interested in capturing interesting foregrounds, I recommend investing in a pair of knee pads. The view from Lockegee Rock calls for a comfortable chair. Although unnecessary, nice to have, a small chair provides an opportunity for a quick or even an extended break after the photo shoot. 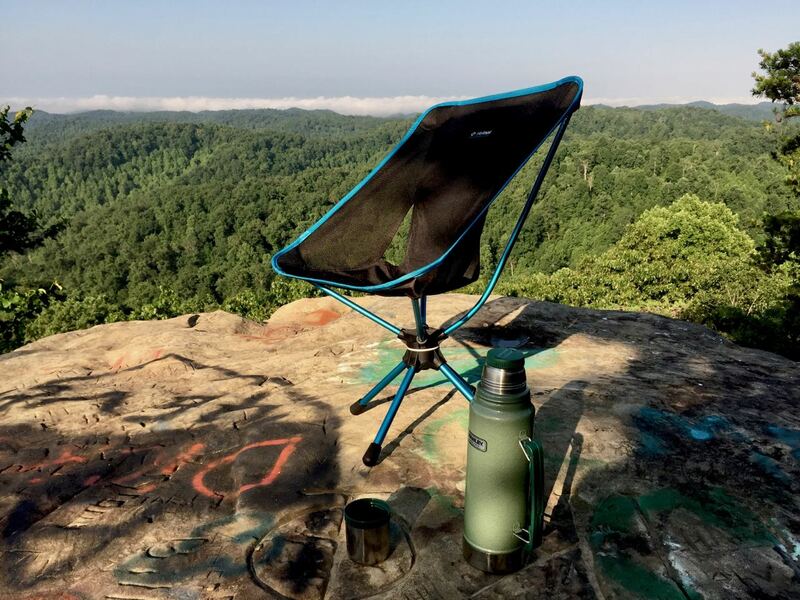 Lightweight and compact, the Helinox Swivel Trek Chair is unbelievable! After capturing a beautiful sunset, I sometimes enjoy kicking back in a comfortable chair with a fine hand-rolled cigar. By the way, I’m not being paid for my recommendations! An image of the Helinox Swivel Trek Chair. A flashlight is a necessity for sunrise and sunset. One can never go wrong carrying a good flashlight in their kit; however, two lights are better than one, and much safer in this case. I usually take a small penlight, but when hiking out to a remote location such as Lockegee Rock, I carry a large 500-lumen flashlight. Consider taking a friend to watch the car and one to hike with you. Isolated and limited, the parking situation may leave you with some heartburn. Indeed, if you feel more comfortable about it, consider traveling with a friend. Bring one to hang out in the car and maybe one to hike the trail, though I haven’t had a single problem leaving my vehicle unattended. Bring water and or coffee. Finally, my favorite recommendation. After capturing a sunrise, I enjoy sitting in my chair with a cup of hot coffee. Of course, whatever you do, don’t forget to pack some water! 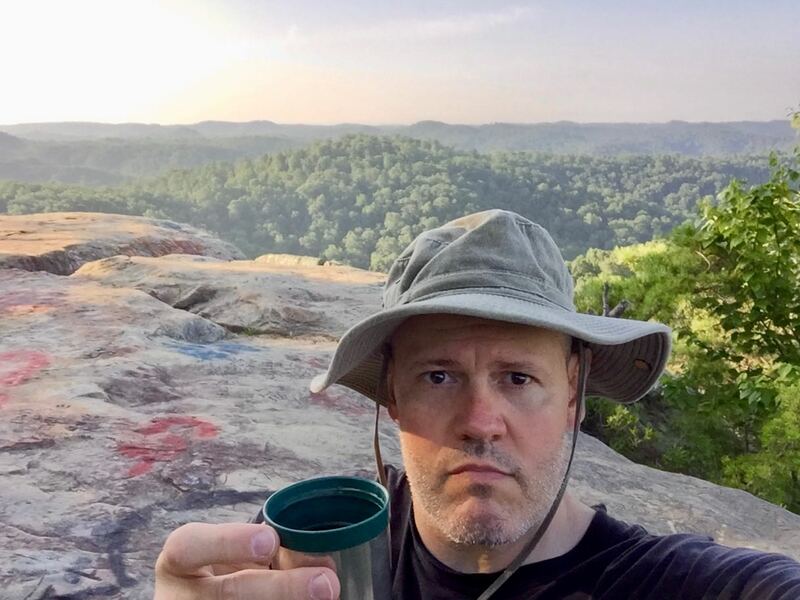 An image of photographer Michael Scott enjoying a cup of coffee on the summit of Lockegee Rock.